ICIWorld . . . where information works for you 24hr per day while you are doing other things. Helping you to connect for your next real estate and/or business transcation. 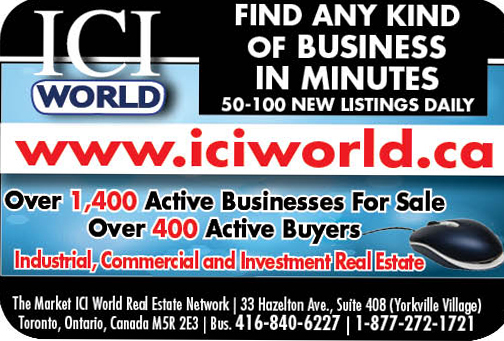 One of the fastest ways in the industry to find, buy and sell business opportunities. To search expired listings which can still be available and are used for networking use Advanced, change Status to your choice. Explanation. Only Executive Members have full access to all listings in Database 1 and 2 and can advertise in Database 1 where the public can see your information and contact you. The public must contact a member for more information on listings that are not clickable. Free Subscribe to receive The ICIWorld Monthly Newsletter delivered 1-2 times monthly. Includes announcements of upcoming events, tips, links, special features, reminders, etc. Free Subscribe ICIWorld Newspaper. Try it out for two weeks and let us know how you like it. Free Subscribe to receive Haves and Wants free by EMail. A daily digest of Haves and Wants. Choose one of the following. Most popular is Ontario All. Others are GTA only, or Niagara, South Western Ontario, Eastern Ontario, Northern Ontario, Far Northern. Business Opportunities is also a popular choice. EMails include contact names and phone numbers, links to web sites, listings, more. 10,000+ subscribers. To place your listings, Haves and Wants and to have them distributed industry wide dailly you must have an Executive Membership. You can unsubscribe directly from any email anytime. You can unsubscribe from any subscription from the EMail. You are dealing directly with a computer.